Togo is a small but industrious country in western Africa. It comes in the shape of a ribbon sandwiched between Ghana and Benin. The official language is French, but the country counts a variety of local cultures. One of them is the Cabiais culture in the northern regions of Togo. 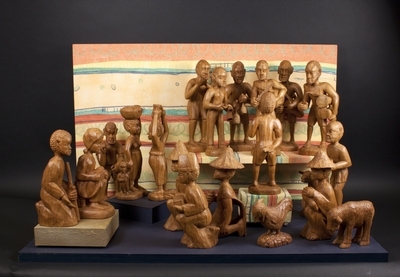 This nativity was carved by Roger J. Bawi, one of the most renowned artists of the country. It was his aim to give the nativity scene some of the special flavor of the Cabiais culture. At birth, the newborn is welcomed by the whole village. Among the many representatives of the population, there is, in particular, the so-called "traditional orchestra." It has a prominent place in this nativity set. The orchestra is composed of musicians playing the drum, the horn, the flute, a kind of rattle, and the gong. The drums, covered with animal hides, are the most important instruments. They create a festive atmosphere and harmony which according to the artist will entice even foreigners to join in the joyful dancing of the villagers. The horn announces the happy event of Christ's birth, whereas the flute lends voice to the jubilant mood of the population. The musician who rhythmically shakes the rattle has a special name. He is called the "griot," a traveling poet and musician, and a herald of oral popular tradition. It is his role to welcome the baby in the names of its ancestors, and of this community with its tradition and customs. The gong player is here to round off the musical welcome. He punctuates the rhythm of the drums, and adds a lighter tough to their deep voices. African culture is known for its zest for life. Thus, this Togolese nativity is a celebration of life with its many meanings. Welcoming in joy the "giver of life," we honor life and yearn for immortality. Wood nativity scene hand-carved by Roger J. Bawi in Togo. Exhibition label written by Father Johann G. Roten, S.M. originally for exhibition entitled "African Symphony" held at Roesch Library, University of Dayton.